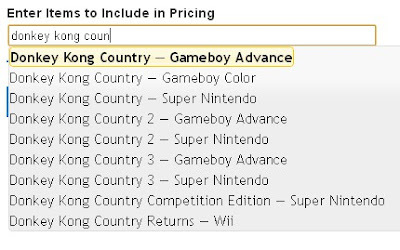 "Currently Included" link - click it to see a list of consoles that will be included in the item list. Click again to hide the list of consoles. Condition - change the condition between used and new. The price will adjust. You're browsing eBay or Craigslist and see a huge package of 50 Super Nintendo games listed for $100. Are you getting a good deal and should you buy them? We've launched a new feature on the site which prices big game lots in three easy steps. STEP 1: Select the consoles you want to include in your item selection. Only games, accessories, and systems for the consoles you select will show in the item list in the next step. STEP 2: Start typing the name of an item you want to add to the pricing. STEP 3: The total value of all your items is calculated. You can change between used and new condition and the price will adjust. You can empty the entire cart and value a new set of games or you can remove an individual item. 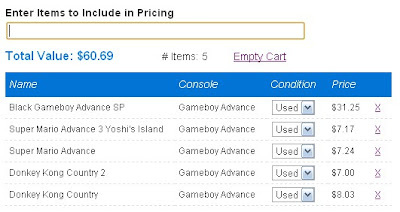 The Pricing Cart can also be used to find the value of your game collection. Enter the games you own and you'll get a value for how much everything is worth. The feature is available to anyone with a free account. Free accounts are limited to only 10 games in one lot, but premium accounts can add an unlimited number of games. Is NBA Elite 11 Worth $1,800? 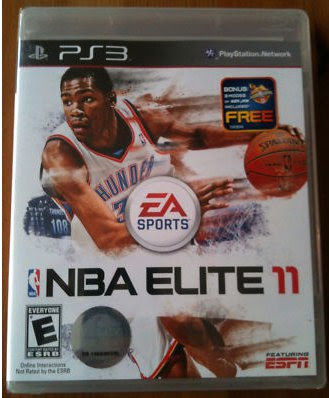 A seller has a sealed copy of NBA Elite 11 listed for $1,800 on eBay. The most recent sale was for $1,500 on August 2nd 2011 so $1,800 would be a pretty big increase in only a few weeks. But when the game first appeared in the wild in February 2011 it was selling for $300-375 in brand new condition so maybe the game is continuing the same fast paced appreciation. The big question collectors are asking with NBA Elite 11 is "how many copies are actually out there?" As a reference, Uncharted 2 Fortune Hunter Edition also for PS3 has 200 copies in existence and recently sold for $2,000 brand new. As a collector there is tons of upside to NBA Elite 11's price, but a much bigger risk too. If you don't there are only about 10 copies in existence then Buy, Buy, Buy but if you think Electronic Arts will release hundreds of these in some charity auction someday then stay far away. What do you think? Will NBA Elite 11 be the rarest game this generation or will more copies show-up? Let us know in the comments below. Users with accounts on PriceCharting.com can now customize parts of the site. 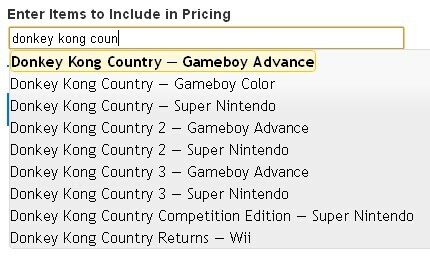 You can change the default sort order when browsing products by console and you can change the default tab on the product pages to compare "Used Prices", "Current Listings", or "Completed Auctions". Create a free account today to start customizing the site and access other features like downloadable price guides. Watch this video to see exactly how to customize the site. The TV Show Storage Wars follows four teams of professional buyers as they purchase repossessed storage units. They buy the units and then see what is inside and how much it is worth. A recent episode featured a super rare "Nintendo NES-001". If your thinking to yourself "aren't all NES systems NES-001. That isn't rare." - you are right. One of the people correctly remember an auction on eBay for $13,000 that included a system and five games, but apparently thought it was the system, which sold tens of millions of copies, and not the extremely rare boxed Stadium Events that made it so expensive. Oops. See a list of some NES games that are actually rare and valuable or a list of the 12 most valuable games of all time. Nintendo has had a stream of bad news lately that has hurt their stock price. A price cut for the 3DS months after it was released, a poorly received (according to investors) Wii U, and slowing sales of the Wii and Nintendo DS. Nintendo's stock has dropped from about $40 in March to $18 this morning. Nintendo has roughly 127,200,000 shares outstanding so at this price the market is saying Nintendo is worth $2.29 billion. For $18 you can buy a share of Nintendo which is like buying partial ownership. This includes partial ownership of brands like Mario, Zelda, DS, and Wii. Partial ownership of their hard assets like factories, offices, and cash. And partial ownership of their debts too. Nintendo's most recent financial statements showed they had 797.5 Billion Yen worth of cash in the bank. Convert this to dollars and Nintendo has $10.3 billion on hand. Nintendo also owes some money to other people which amounts to $1.8 billion. So Nintendo could pay all their bills and still have $8.5 billion in cash. With 127 million shares outstanding each share owns $66.80 of Nintendo's cash pile. So for $18 you can buy ownership of $66 in cash plus get all the Nintendo brands thrown in too. I'm sure these next few quarters will be tough for Nintendo with declining DS and Wii sales, no Wii U released until 2012, and a loss on the sale of every 3DS, but that is a really huge cash cushion to ride through those hard times. Full Disclosure: I do NOT own any Nintendo stock. We are trying to determine how gamers decide what is "rare" and what isn't. Is it the number of copies in existence, how often the item comes up for sale, the price, or a combination of all of these.